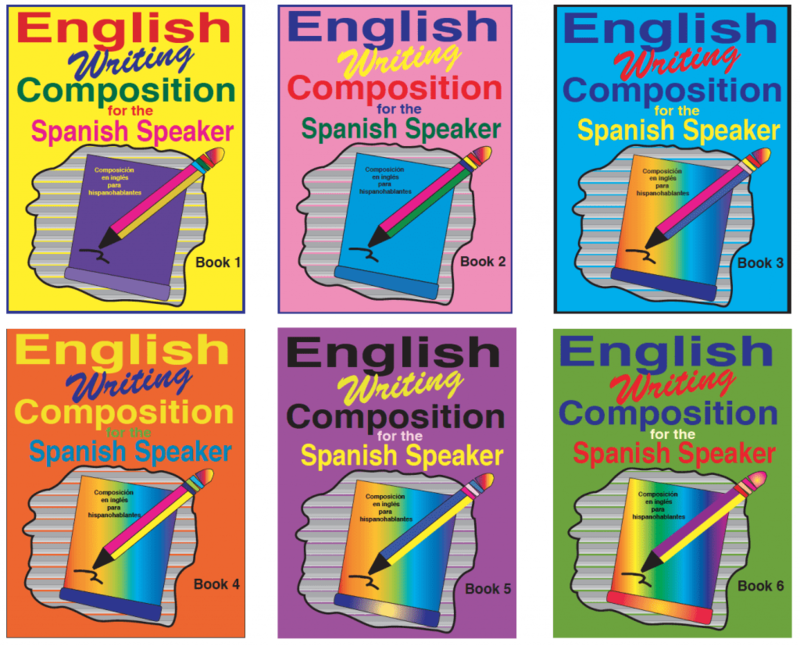 Fisher Hill has a six-workbook series call English Writing Composition for the Spanish Speaker. This series was written to help Spanish speakers improve their English writing skills. The series uses a structured and systematic approach in teaching the different writing skills. English Writing Composition for the Spanish Speaker Book 1begins by teaching basic sentence structure, progresses to longer, more detailed sentences, and ends with students writing informative paragraphs. The final book in the series includes instruction and practice for writing compound and complex sentences. It also provides instruction and practice for writing essays. By the time students finish the six-book writing series, they will be able to compose informative, operational, and persuasive essays. These six workbooks are full of writing activities and graphic organizers to help students improve their writing skills. The workbooks are bilingual. The directions are in Spanish. The English translations for the Spanish directions are located at the back of each book. There is also an answer key at the back. As with all skills, writing takes practice, practice, and more practice to become proficient. The English Writing Composition for the Spanish Speaker series provides the practice and information Spanish speakers need to improve their English writing composition skills. English Writing Composition for the Spanish Speakeris an excellent series to use in conjunction with English Reading and Spelling for the Spanish Speakerand English Reading Comprehension for the Spanish Speakerseries because the books in all three series use the same vocabulary. English Vocabulary for the Spanish Speakeris another six-book series that reinforces the vocabulary presented in the other three series. By using the four series together, students get an excellent foundation in English literacy. These placement tests can be found under Teacher Resources on our website www.Fisher-Hill.com. Teacher Resources can be found on the top toolbar. Click on Teacher Resources, then click on Reading and Spelling. Then scroll down to the placement tests. The placement tests are called Sound Spelling Placement Test Book 1 and so forth. Sound Spelling Placement Test Book 1 is for level one. The Sound Spelling Placement Tests are spelling tests to determine if a student has mastered the sounds for that level. The teacher or volunteer gives the spelling test to the student. There are also student test forms under Teacher Resources. Adults like our workbooks because the pace is reasonable, print is large, directions are in Spanish, there’s lots of pictures but the content is for adults. Teachers like our books because everything is ready to go! Visit our website at www.Fisher-Hill.com to learn more about English Writing Composition for the Spanish Speaker and our other series for Spanish-speaking teens and adults.